WITS 2009 is on right now, doctor where are you? Harry Jerome Skatepark in North Vancouver is looking to hire a skateboard instructor. If you know of somebody that might be able to fill this position, please forward this along to them. You have until June 26th (next Friday) to get your resume in. You can download a PDF of exactly what they’re looking for here. 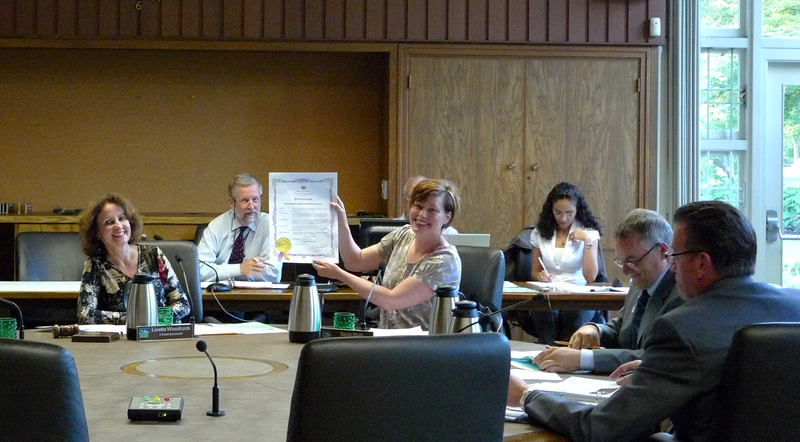 Commissioner Blyth proudly holds up the proclamation after reading it aloud at last night's Park Board meeting. MEDIA: High Res photo available at end of story. Last night I popped by the Vancouver Park Board office on my way down to 2nd Beach for a swim. I hung out long enough to watch Sarah read the proclamation in (on behalf of Mayor Gregor), officially declaring it ‘Skateboard Week in Vancouver’. It’s quite rare to have the Park Board meeting stop, and make such a declaration. So that’s pretty awesome. WHEREAS skateboarding is embraced by tens of thousands of young Vancouverites and is an internationally recognized sport that continues to grow around the world. WHEREAS over the past 10 years, Vancouver has created six new internationally known skateboard parks and relaxed the existing ban of skateboarding in the streets, thereby reinforcing the city’s status as the skateboarding capital of the Canada. WHEREAS the City of Vancouver has a long history of supporting skateboarding stretching back to Expo 86 where the Transworld Skateboard Championships were held as well as events like the Slam City Jam, which is now part of the World Cup of Skateboarding. WHEREAS this year, 15 professional skateboarders will be joining over 5,000 young and old skateboarders around the city to celebrate their passion during the annual Go Skateboard Day, which will feature events throughout the city. NOW THEREFORE, I, Mayor Gregor Robertson, on behalf of the City of Vancouver, do hereby proclaim June 15 – 22, 2009 as “Skateboard Week” to recognize the importance of this sport in our city. I further proclaim June 21, 2009 as “Go Skateboard Day”. Now, as far as proclamations go… Sure, they sound a little hokey, but they don’t just hand them out for anything. Sarah put some work in on this one, and with special nods to Jay Balmer & former Mayor Larry Campbell for sure, as KK noted in the comments on the last post. While this may seem to be a small thing, it definitely cements (no pun intended) our viability as a legitimate sport and group in the city. Good job to all. 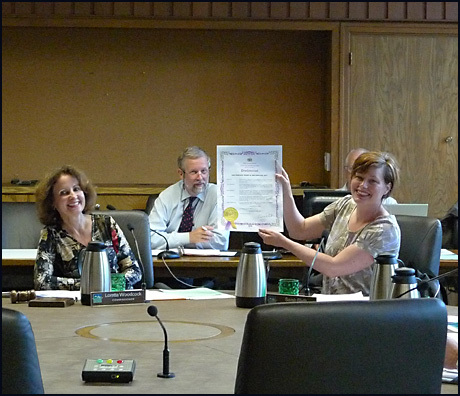 MEDIA: High Res link: Feel free to use this high res photo of Commissioner Blyth holding up the Skateboard Week Proclamation. With this upcoming Sunday being Go Skateboarding Day and Emerica’s Wild in the Streets, we’ve had the City of Vancouver officially declare this week, June 15-22 as “Skateboarding Week”. Tonight at 7pm, at the beginning of the regular Park Board meeting, Commissioner Sarah Blyth will read out the official proclamation declaring it Skateboard Week on behalf of Mayor Gregor Robertson and the City of Vancouver. If you happen to be rolling by the Park Board office, come on by for Sarah’s reading. “Skateboarding has come so far. Only ten years ago it was illegal to skateboard in the streets, skateboards were being confiscated and ticketing boarders. Skateboarders were buying boards with no place to use them. Earlier in the year the Park Board voted unanimously to approve the motion for the skatepark at Kensington Community Centre, to add to the achievements of the VSBC, which have past successes such as the Hastings Skatepark, the Downtown Plaza skatepark as well as relaxing the skateboard laws in the city of Vancouver. “10 years ago kids were getting tickets, getting their boards confiscated, and there was nowhere to skate except for China Creek. It’s great to see the Park Board looking at what kids are doing today, and trying to support that, to keep the kids active and engaged” says Chris Young, a director with the VSBC since 2000. 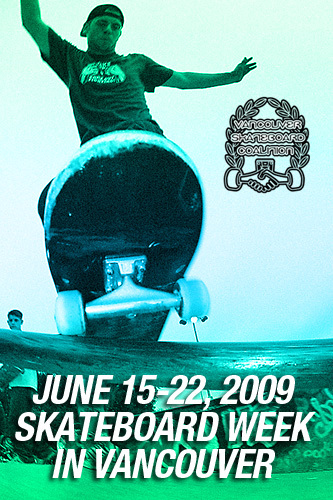 NOW THEREFORE, I, Mayor Gregor Robertson, on behalf of the City of Vancouver, do hereby proclaim June 15 – 22, 2009 as “Skateboarding Week” to recognize the importance of this sport in our city. It’s times like this when we’d like to acknowledge the hard work of those on the Vancouver Skateboard Coalition, as well as the tireless work from those at City Hall, the Vancouver Park Board – both at the Commissioner’s level, and also at the staff level, including Piet Rutgers, and especially Mark Vulliamy for dedicating the past decade to our cause. Past Park Board Commissioners we’d also like to take time out to thank include Alan DeGenova and Lindsay Popes. 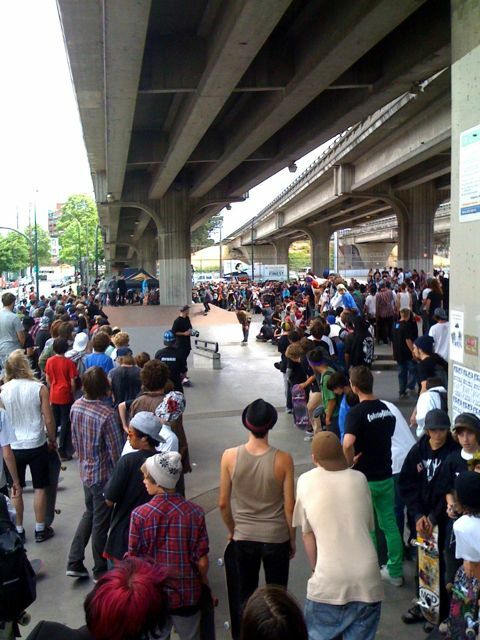 If it weren’t for all of these people, I can assure you Vancouver would not be the skate mecca that it’s known as today. So, much thanks go out to you all. Skateboarding week ends with “Wild In The Streets” on Sunday, June 21st. You can learn more about that here, which takes place on Go Skateboarding Day, and you can learn more about that on the Go Skateboarding Day website. 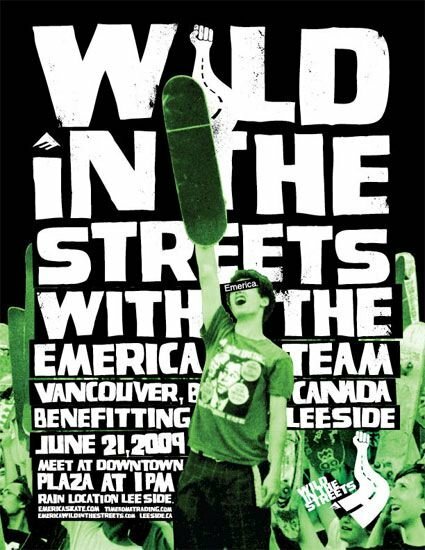 Last year's Wild in the Streets in Vancouver... From the Emerica site. What are you doing this Sunday? Join approximately 5000+ skateboarders as they hit the streets in Vancouver this year for Emerica’s Wild in the Streets. The goal of Wild in the Streets is to build community & raise awareness of skateboarding and the needs of skateboarders. 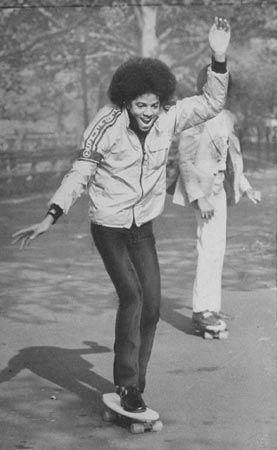 It is our hope that Wild in the Streets will someday take on the character of a large-scale, decentralized grassroots movement for the benefit of skateboarders everywhere. We believe in the ability of skateboarders to empower themselves to do great things. Be a part of something amazing, or better yet, create your own amazing event. T-Shirts of this epic event are being sold at Antisocial (2337 Main Street) and at the Underworld Emerica team signing on Saturday, with all benefits going towards Leeside. Learn more about that here. Wild in the Streets Vancouver (Meet at The Plaza at 1pm) Will probably run until at least 7 at various spots and parks around the city. To learn more about Wild in the Streets, please see either their Facebook page, or Emerica’s Wild in the Streets website, and for up to the second updates, follow the WITS mayhem on Twitter. We’ll just go ahead and throw this out there… Please be respectful and careful out there on Sunday. VSBC Board member Jeff Cole getting loose on the mini. Tens of thousands of people came out to flood the streets and celebrate Car-Free Day yesterday at events all over Vancouver. 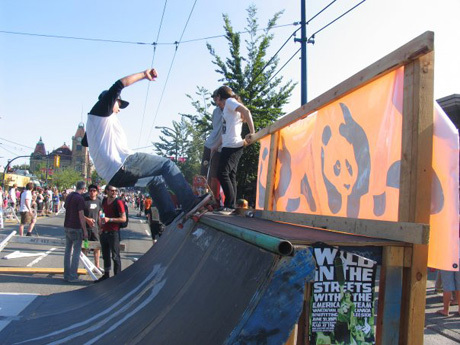 The Vancouver Skateboard Coalition had a ‘booth’ and mini ramp set up on Main Street between 13th & 14th Avenue. There was also a game of skate hockey, which seemed to catch quite a few onlookers off-guard… Good times. Thanks to Michelle Pezel/Antisocial for coordinating the day, and to all those that helped set-up/take down the ramps, and to those shredding the ramp all day and keeping the good times flowing. Thanks also to Phil Larin for shooting some pictures. 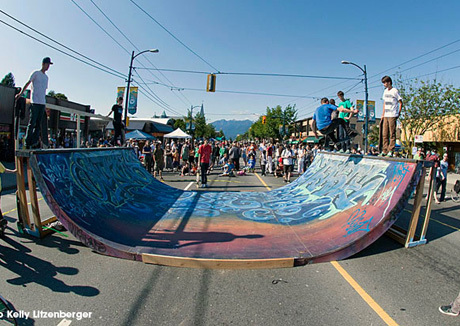 This Sunday, June 14th, the Vancouver Skateboard Coalition will have booths and ramps at the Car-Free Day events on both Main Street and Commercial Drive, just as we did last year. Last year we raged all day, and well into the early evening, so come on by to say hi and shred the mini. Check out what Frank had to say about last year’s Car-Free Days on the Push.ca website. If you’re looking for more info, check out the Car-Free Day website.